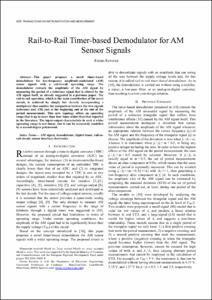 This paper proposes a novel timer-based demodulator for low-frequency amplitude-modulated (AM) sensor signals with a rail-to-rail operating range. The demodulator extracts the amplitude of the AM signal by measuring the period of a reference signal that is altered by the AM signal itself, as already suggested in a previous paper. The rail-to-rail operation, which is the main contribution of the novel circuit, is achieved by simply but cleverly incorporating a multiplexer that enables the comparison between the two signals (reference and AM) just at the beginning and at the end of the period measurement. This new topology offers an operating range that is up to more than four times wider than that reported in the literature. The input-output characteristic in such a wider operating range is not linear, but it can be accurately modeled by a second-degree polynomial. © 2017 IEEE. Personal use of this material is permitted. Permission from IEEE must be obtained for all other uses, in any current or future media, including reprinting/republishing this material for advertising or promotional purposes,creating new collective works, for resale or redistribution to servers or lists, or reuse of any copyrighted component of this work in other works. Reverter, F. Rail-to-Rail Timer-Based Demodulator for AM Sensor Signals. "IEEE transactions on instrumentation and measurement", 1 Gener 2019, vol. 68, núm. 1, p. 306-308. Amplitude-modulated (AM) signal, demodulator, digital timer, rail-to-rail circuit, sensor interface electronics.